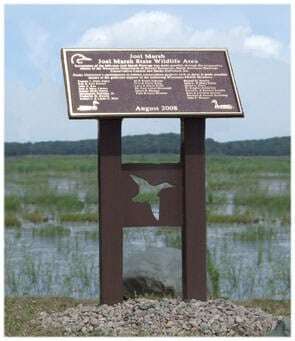 As shown in the photo, the heavy duty welded steel monument stand is designed to accommodate a 32” wide x 18” tall bronze dedication marker. The design accommodates the customer supplied plaque to be installed in the top, which has a solid steel, 3/4″ containment lip to allow for vandal resistant installation of the marker plate. The stand without owner supplied marker weighs approximately 150 pounds and can be easily handled by two people. It is designed to be anchored and buried in the ground with two legs, each with a steel anchor plate with four ¾” diameter anchoring holes. The entire assembly is coated with an industrial dark brown powder coat finish for added durability. Par-Kut fabricates this product to specific order so wildlife or other custom cut outs are not a problem. The illustration includes a duck in flight. Contact Par-Kut’s Specialty Fabrication Art Metal department for ordering information by calling 800-394-6599 or by using the contact tab on the main company web site.